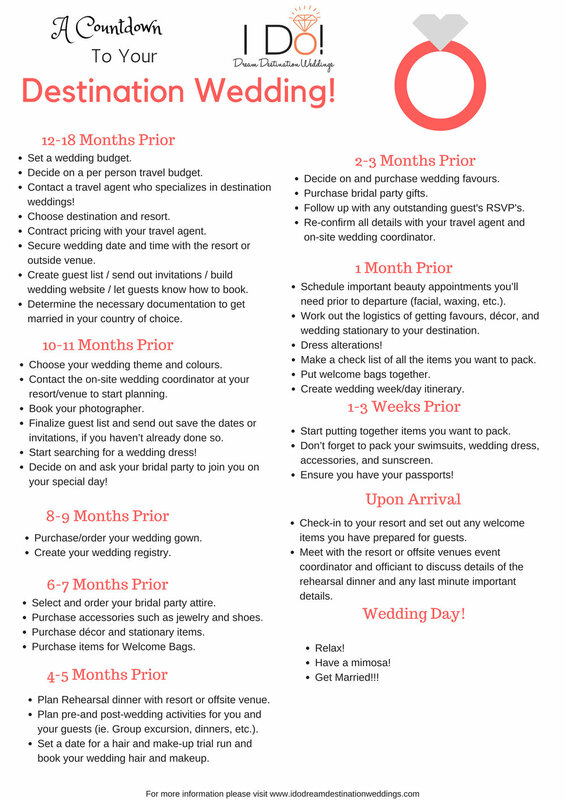 A Countdown to your Destination Wedding! Congratulations! You've made the decision to have a destination wedding... But now you are wondering, what comes next? Don't worry, we've got you covered! Simply follow our "Countdown to your Destination Wedding" to make sure your planning stays on track! In order to help service my clients better, I am always working on educating myself and learning about new destinations. This month I decided to make it my goal to complete the Saint Lucia agent training program. I cannot believe what this beautiful island has to offer. Ask me for more details on what you can expect to experience on your St. Lucian holiday! It is official! I've become a Certified Destination Wedding, Honeymoon, and Romance Travel Specialist! HALIFAX, NS., October 26 - Carina Shortliffe (I Do! Dream Destination Weddings by TravelOnly, Halifax, NS.) is now a Certified Destination Wedding, Honeymoon, and Romance Travel Specialist (CDWHRTS) recognized by the Destination Wedding & Honeymoon Specialists Association (DWHSA). As a DWHSA member, Carina completed all requirements for this designation, including a certification exam covering the basics of planning and managing all types of romance travel (from destination weddings and honeymoons to vow renewals, babymoons, familymoons, engagement trips, anniversary trips, and more). "We're very proud of Carina's accomplishments," said Lisa Sheldon, DWHSA's executive director. "She deserves her well-earned designation as a dedicated travel professional who continues to enhance her education on romance travel, and her new certification is further proof that she can plan once-in-a-lifetime romantic getaways for every couple who works with her." Formed in 2013, the Destination Wedding & Honeymoon Specialists Association (DWHSA) is the world's largest network of romance travel professionals, with more than 750 agents in North America and around the world engaged in planning and selling destination weddings, honeymoons, and romantic getaways. More information is available at JoinDWHSA.com. As I sit here looking back on my photos from last week’s vacation to Jamaica, I can’t seem to forget that musty Caribbean smell, the direct sunlight warming my skin, and the soft sand squishing between my toes. Oh what I wouldn’t do to be back in Jamaica at Sandals Royal Plantation. My husband and I ventured off to Jamaica last week for what I like to call our “babymoon”. I was 22 weeks pregnant and decided that before baby arrives this winter, I’d like to go all out and be pampered like I’ve never been pampered before…. This may have been a mistake; because now it will be hard to lower my expectations for future vacations! So where did we choose to go? I am sure you’ve guessed it already, but if I haven’t made it clear yet, it was to none other than the luxurious Sandals Royal Plantation in Ocho Rios, Jamaica. This was our first time to Jamaica and to a Sandals resort. All I can tell you is that Sandals Royal Plantation is like no other resort we’ve ever visited before. Although the resort could use a few updates, this is truly a 5 star experience and the epitome of luxury and relaxation. Royal Plantation is Sandals only All-Butler Suites resort. It is an intimate resort with only 74 oceanview rooms set on a coral bluff in beautiful Ocho Rios. Yes, you heard me right… every room has an oceanview and comes with your own butlers! Seriously, how could this place not be amazing? Honestly, the attention to detail in their service is unparalleled. Unlike most resort stays, which begin upon your arrival at the resort, with Sandals Royal Plantation your vacation begins the minute you step out of the airport customs. Sandals has their own private lounge within the airport arrival gate. Once you arrive at the airport, head through customs and immigration, pick up your bags and you will then be greeted by a friendly woman who will check you in to the Sandals lounge. Your bags will be taken to your shuttle for you while you are served a drink of your choice by one of the lounge attendants. They also feature little snacks, very nicely decorated washrooms to freshen up in, and comfortable chairs and couches to relax on while you await your shuttle. You will typically not wait any longer than 30 minutes for your shuttle which will bring you to your resort. Approximately 25 minutes after our arrival to Montego Bay we were called to our shuttle. We were delighted to find out we were only sharing the van with one other honeymoon couple from Texas. They were sweet newlyweds who had just been married two days before! This was their first visit to Jamaica as well so we all chatted and got to know each other a little bit. Our driver was wonderful and gave us tidbits of information about Jamaica and answered all our questions as the beautiful scenery of beaches and palm trees passed us by. We finally arrived at the resort an hour and a half later. Upon our arrival the reception staff greeted us with cold towels and flutes of champagne! I knew this would be my kind of place! They then seated us in the lobby sitting room while they prepared our check –in. One of our two butlers (who alternate days working), greeted us in the lobby and took us to our room. Audelle, showed us around our room, checked us in on an Ipad, and proceeded to take us on a tour of the resort to help orient us. With there only being 74 rooms, it is a small, intimate resort, so it wasn’t hard to find our way around, but we appreciated the tour nonetheless. Since we were only there for a short 4 night stay we already knew everything we wanted to do during our visit. So with our butler, we planned out our stay. Audelle made our reservations for golf, dinner, and our maternity photo shoot… he didn’t write a thing down and I was skeptical about whether he would remember what we had requested. Well lo and behold, he knew every day what and where our reservations were for… have I mentioned that these guys are trained in partnership with the Guild of Professional English Butlers!? Oh and get this… before he left us to begin our babymoon he left us with a cell phone to call him on in case we needed anything from him. We were able to get in contact with him 24/7… not that we did lol! Visitors to Jamaica can be married just 24 hours after arrival, provided a prior application has been made for the marriage license. Couples residing in Quebec would need a notarized and translated English copy of all documents accompanied with photocopy of original French documents. e) Change of Name: if you have legally changed your name, you must submit original documents to the Embassy or consulates of the Dominican Republic for legalization. Prior to departure, all above documents must be translated into Spanish, legally certified by a professional, and legalized by the Embassy or one of the consulates of the Dominican Republic in Canada. There are no residency or waiting periods for legal marriages in the DR; however, some resorts have a minimum requirement so they have enough time to prepare for your wedding. Witnesses: You will require two witnesses. If you are bringing the witnesses along with you they will require their passports. If you are planning on eloping, the hotel can provide you with witnesses. For further information, please contact the Embassy or consulates of the Dominican Republic. Have you already chosen a destination for your wedding? If so, you'll want to make sure that you familiarize yourself with the marriage requirements at your destination. In this four part blog we will be laying out the requirements for the most popular destinations for Canadian couples. If you are planning a wedding in a country that is not listed please contact us and we can provide you with the information your require on your specific destination. If you haven't already decided on a destination perhaps taking into consideration the marriage requirements at different destinations will help you to make your choice. The requirements differ significantly from destination to destination. If you have never been married before the marriage requirements for Cuba are relatively simple. A sheet that lists the following: names, home address, occupations, level of education, nationality, and the full names of your parents, living or deceased. You will attach a copy of the photo page of your passport to this sheet and will be required to fax or email copies of all documentation to your hotel in Cuba at least three weeks in advance of your arrival. This will all be coordinated through the wedding planner at your resort. If widowed: his/her Birth Certificate, Certificate of Marriage, and Certificate of Spouses' Death. Have your birth certificate and any divorce/marriage/death certificates translated into Spanish and certified by a notary public and legalized by the Cuban consul in Canada (service fee applies). You are required to be in the country for a minimum of 72 hours. Be sure to bring all your original documents with you. Your marriage will be formalized in the name stated on your passport. Your passport must therefore be correct and the name on your passport must match that on all your other documents. After your wedding, your Marriage Certificate will be couriered at the hotel’s expense to the home address on your documents. Your marriage is legalized by the Canadian Embassy in Havana and the Cuban Foreign Affairs department. For more information, contact the Cuban Consulate in Toronto or Montreal. Kalyn & Andrew Married in a Cuban Paradise! I would like to begin this blog by saying thank you to Kalyn and Andrew for allowing me to start my new "Real Brides, Real Destination Weddings" blog off by sharing their destination wedding story! I was lucky enough to have connected with Kalyn about a year and a half go on an online destination wedding forum. We were to be married at the same resort only a few months apart from each other. As a new destination bride myself, unfamiliar with the challenges that destination weddings can present, I relied on Kalyn's experience. We shared our wedding plans, ideas, and tips through the entire process. Here we are almost 8 months post-weddings and although a lot has happened to both of us, including the fact that I started I Do! Dream Destination Weddings, we still maintain a connection and share our life adventures and our love of travel. So thank you Kalyn for not only helping me out with this first blog, but for also helping me maintain my sanity throughout the wedding planning process! "From the very moment Andrew proposed on that beach in Cuba, we said this is where we will be married". Kalyn and Andrew met at a mutual friends party in April of 2005 but nothing came of it until later that year when they both began working at a local clothing store. Kalyn and Andrew instantly hit it off this time. They both knew that there was something about one another that was different from their past relationships. After many years of dating, getting to know each other, and going through the good and bad times together, Andrew finally proposed on January 24th, 2012 in Cuba on the beach. Shortly after they returned from their vacation, they knew they would be returning to the beaches of Varadero and the Iberostar Laguna Azul to say their "I Do's"! "when we finally got to see each other at the aisle on the beach. As well as the time we spent alone taking photographs at the Varadero Golf Club... it was a time where we were able to enjoy each other for an hour out of our day. She also mentioned that their week long celebration was a blast and that family and friends still rave about how much fun they had in Cuba for their wedding week! I asked Kalyn if she could give one piece of advice to couples who are either thinking of a destination wedding or are in the beginning stages of planning, what would it be? "encourage new destination wedding brides to take a deep breathe and let everything fall into place. Don’t stress about not hearing back from the wedding coordinator, they work last minute but they know what they are doing. Everything was perfect and done beautifully for our wedding". "to not send RSVP’s with stamps with our wedding invitations. You will hear who has put down deposits from your travel agent, which is an RSVP. We only received about two RSVP’s in the mail and we sent out over 100 invitations". Congratulations! You have decided on a destination wedding. Your next step is to start thinking about where you'd like to say your “I Do's!”. For some couples this will be an easy decision. You may choose the destination where you met or a destination that has special meaning to you. For others this could be the biggest, most difficult decision you will make throughout the entire wedding planning process. For those of you who didn't meet somewhere special, have never been anywhere together, or just want to choose a new location altogether, here are some points to consider when making your decision. Take into consideration the length of time it takes to arrive at the destination. Are there direct flights or will you be required to transfer flights? Choosing a destination that has short flight times, direct flights and short transfer times (from airport to resort) makes it more appealing for guests to attend. It also means more time at the destination rather then spending your precious vacation time in transit. You dream of being married on the white sand beach of Mexico on your anniversary in October. This sounds lovely and romantic, but it is important to know that hurricane season in Mexico runs from June to November with the highest incidence of hurricanes occurring in September and October. If you are willing to take a chance on the weather then you will likely be able to take advantage of some great rates. Other couples may decide to rethink their wedding date and/or destination in order to ensure the best possible weather. This is where doing your research and working with a knowledgeable destination wedding specialist will really come in hand. Have you always envisioned walking barefoot down the beach or was your dream to walk down an aisle in a large castle? When we think of destination weddings we often picture a beach wedding; however, a destination wedding can be celebrated anywhere in the world and if your dream is to marry in a castle then perhaps somewhere in Europe would be a better fit. I always recommend having a budget in mind before deciding on a destination. If you have an unlimited budget your options are endless and you can choose a destination anywhere in the world! If you are on a budget there are many budget friendly destinations to choose from including the Caribbean, Jamaica, Dominican Republic, and Mexico. Your departure gate will depend on which destinations will provide you with the best value for your budget. Again this is when working with a knowledgeable and experienced wedding specialist will come in hand for you. Lastly and most importantly, you may want to take into consideration the legal requirements for a marriage ceremony at the destination. Every country has their own set of rules that you must follow. Many countries will require you to be in the country for a minimum duration before they can legally marry you (i.e. Jamaica requires a minimum of 24 hours while Cuba requires a minimum of 3 days). Most countries will also require copies of your birth certificates and these may or may not have to be translated into the official language of the country. If you or your fiance have been divorced there are also additional requirements that may need to be addressed. As you can see there are many things to consider when it comes to marriage requirements. Please stay tuned for my next blog on the “Specific Marriage Requirements for Canada's Top Destination Wedding Destinations”! Let me guess... you are envisioning the white sand squishing between your toes, your veil blowing in the warm breeze while you walk down the aisle towards your husband-to-be with the sun shining and the turquoise water shimmering in the distance. Sure this sounds idyllic and romantic. And you are probably excited and ready to jump right into the wedding planning. But have you thought about the logistics of a destination wedding and what it means for you and your guests? There are a number of things you should consider before deciding if a destination wedding is right for you. I have compiled a list of things to think about, drawn from my personal and expert experience, which I hope will help you make the decision! 1) Ensure your reasons for having a destination wedding are in line with your expectations. Think of the reasons why you want to have a destination wedding. Is it that you are thinking a destination wedding will be stress-free and less expensive than a traditional wedding? Is it that you and your fiance met at the destination? Does the destination have special meaning to the two of you? Destination weddings can bring about their own challenges that may cause some stress including objections from friends and family or the stress of trying to plan from a far with vendors where there may be language barriers. And although destination weddings can be less expensive than a traditional wedding it is often because you have less guests attending, not necessarily because the wedding venues or vendors are less expensive. The good news is you can typically make a destination wedding as inexpensive or costly as you'd like. 2) Discuss your plans with your parents and important family members and friends who are on your “must attend” list. It is important to discuss your plans with your parents and most important family members and friends to ensure that they will be able to attend. You may (or may not) encounter objections from these people and you need to make sure that you will still be happy with your decision even if those people can't attend. Keep in mind that when you have a destination wedding you are asking a lot of people in terms of time and money. 3) Understand that not everyone will be able to attend your wedding. More often than not when couples announce their decision of a destination wedding to family and friends everyone is on board and so excited for the couple. Don't be disappointed when it comes time to put down deposits on the vacation package and you find that a number of those guests tell you they no longer can attend. Not to say that this will happen, but from personal and expert experience I have found this to be a common trend. But don't take it personally. As we stated above you are asking for people to take time off of work, use their vacation time, and spend a significant amount of money for your wedding. It is not that they do not want to attend, it is most likely a mix of the logistics of getting time off of work, time away from family, and finances. Keep in mind no matter what happens you and your fiancé are there to celebrate your marriage union and you will have the most amazing time with the friends and family members who do attend. 4) Let go of control and relax! For “A” type personalities planning a destination wedding can be difficult. You will most likely be planning from a distance and will not have complete control over your wedding details. You will have to leave those details to your local wedding coordinator. If you can let go of the reigns and go with the flow though you will have an amazing stress-free and beautiful wedding! And don't worry, you will still be able to add your own personality and finishing touches to the wedding! 5) Have a back up venue / plan for your wedding ceremony. When we envision a beach wedding we usually see a picture perfect day with the sun shinning and not a cloud in the sky. However, it does rain in the Caribbean. By doing your research and choosing to travel in the “dry” season will help you to limit your chances of rain. Some couples choose to “chance it” and travel during the rainy season because you can often receive great value on your travel packages during this time. We always recommend choosing a resort or venue that has a back up plan in case of inclement weather. This way no matter what mother natures has in store for you on your wedding day you can guarantee yourself an amazing wedding day. It will also help to eliminate any last minute stress if you have a back up plan in place! If you are still reading this and thinking that a destination wedding is for you, then congratulations!!! You have just made the best and most exciting decision! Destination wedding are special and are amazing experiences for not only you but also your family and your guests! You will not regret your decision and you are well on your way to creating lasting memories of a lifetime for you and your family! Carina is the owner of I Do! Dream Destination Weddings. Based in Halifax, NS she is able to work locally or nationally with clients. She is passionate about traveling, weddings, and sharing her knowledge with others. As a past destination bride herself, she is well versed in the challenges that destination weddings present. She loves to help brides and grooms navigate their way through their dream destination weddings. She also loves working with couples who take the more traditional at home wedding route by helping them plan their dream honeymoon.